Super Stock racing in the NHRA is a fascinating exercise in maximizing a combination inside a very tight box of rules. Rich Rinke knows a thing or two about Super Stock racing, so when his 1969 AMX needed a wicked induction system he turned to the team at CFE to help develop some cylinder heads. 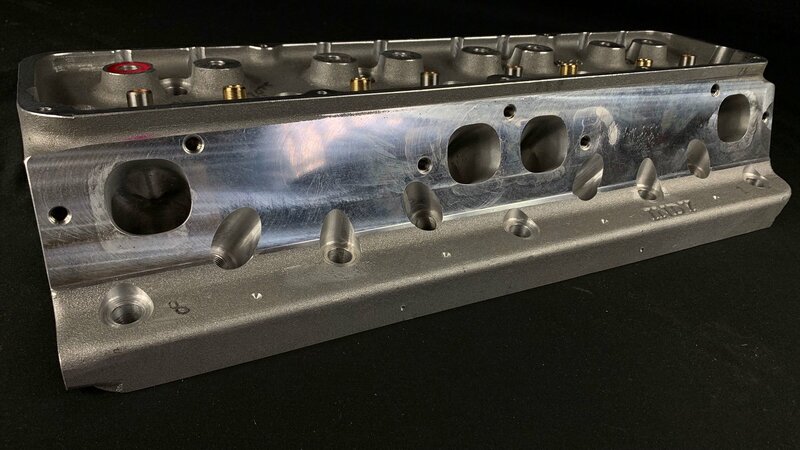 The final product of this project is a magnificent pair of heads that are on the cutting edge of cylinder head development and problem-solving. Rinke is the owner of Turn-Key Automotive and it’s responsible for building all of the new generation COPO Camaros. The AMX that Rinke wanted to build his 340 horse/390 cubic-inch engine for is an original factory Super Stock racecar from AMC and one of only 53 built in 1969. These cars have a rich drag racing history so it makes the project even more interesting for all involved. For the possible AMC head castings that came on the engine, the NHRA requires factory stock volumes for head measurements. The intake port volume must be 205cc’s, the exhaust port volume needs to measure 77cc’s and the chamber volume needs to be 57cc’s. The valve diameters must be 2.080-inch on the intake side and 1.725-inch on the exhaust side. Since there’s only so much you can change on a Super Stock engine due to the tight rules, engine builders have to get creative. 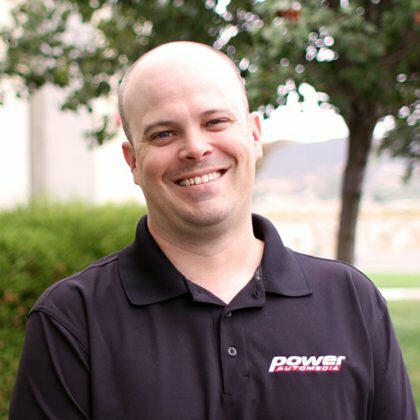 Scott Kieffer from CFE explains why creating a high-horsepower AMC engine is a bit of a challenge. Having the ability to work with a set of aluminum heads as opposed to iron heads is a nice upgrade on paper, but it presented CFE with a whole new set of challenges. 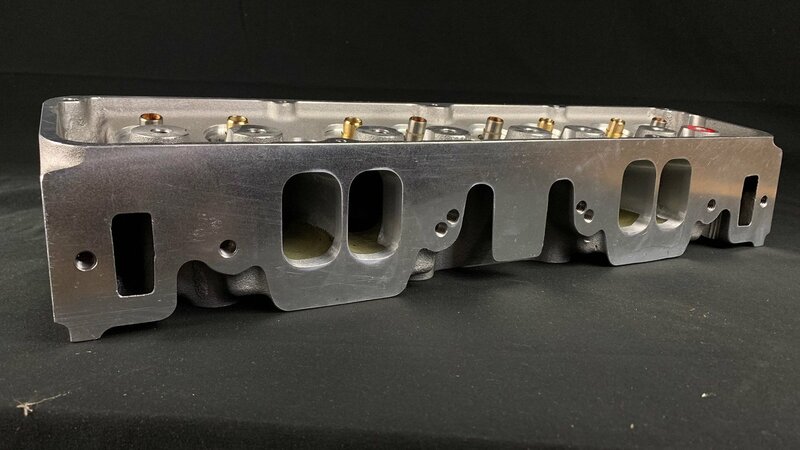 Since the INDY cylinder head comes with a larger valve size and port volumes, CFE needed to come up with a way to shed some of that volume to stay within the Super Stock rules. “The head as sold from INDY comes with a 235cc intake port, a 105cc exhaust, and a 69cc chamber. So a tremendous amount of welding was necessary to get the material needed to have full clean up with the intended port design. 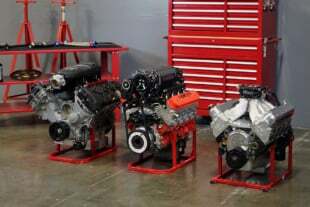 Working with a third head casting as a model and lots of epoxy, once a satisfactory intake port, exhaust port, and chamber were hand finished, the necessary data was taken to compose a CNC program to port what would become the actual race heads,” Kieffer explains. Kieffer explains further what development went into these custom heads. 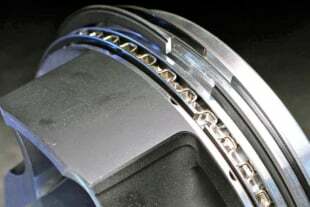 “We began by shortening the intake port via machining the intake flange. From there, we dammed the port openings with a bridge of weld across the floor and raised the floor with epoxy. On the exhaust side, the dogleg AMC ports were also a problem as nothing there really spells horsepower. So we filled the exhaust ports with weld and redesigned the exhaust ports and engineered a new bolt pattern. 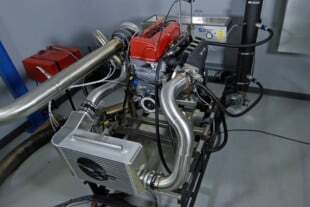 Both the intake and exhaust seats were finished with a CFE Pro Stock-style valve job and all the volumes were finished within one cc of the NHRA-specified factory volumes,” Kieffer says. 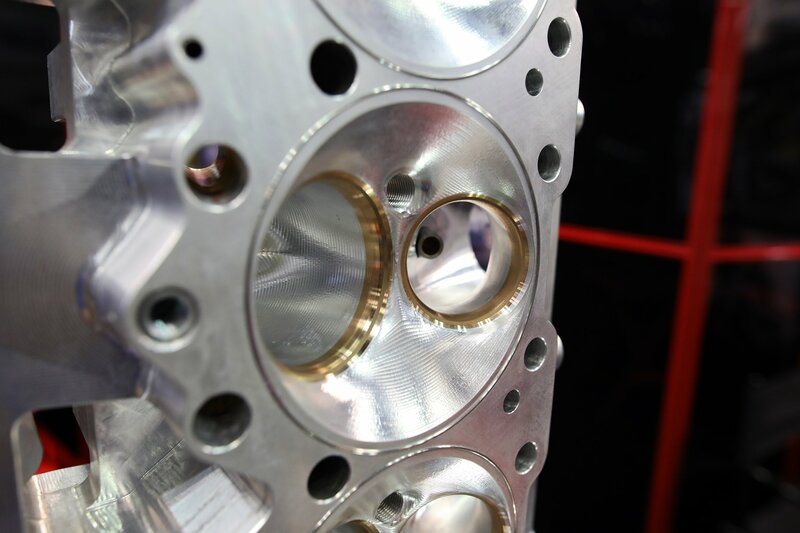 For an engine that will see a lot of elevated RPM levels, a stout valve train is required. CFE had to again put on their thinking caps to create something that would be robust enough to deal with abuse while remaining within the Super Stock rules. 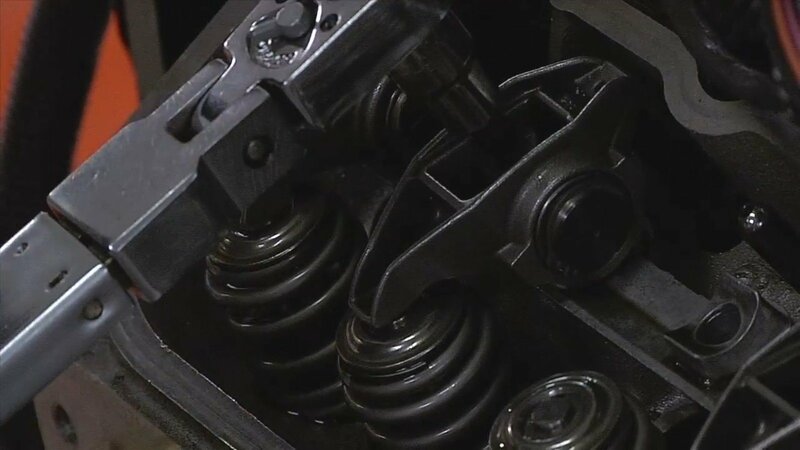 “On the valvetrain, we installed alloy seats and guides and designed the custom 3/8-inch severe duty steel valves since stock guide diameters are required. Manley handled their creation. Along with packaging enough installed height for growth, we set up the head’s rocker pads to work with the existing Jesel rocker kit that is made for the Indy 401 SR head. Rinke plans on starting off in excess of .800-inch lift on the cam with help from Comp Cams,” Kieffer explains. After the heads were complete the next task for CFE was to find a way to get air into their beautiful creation. 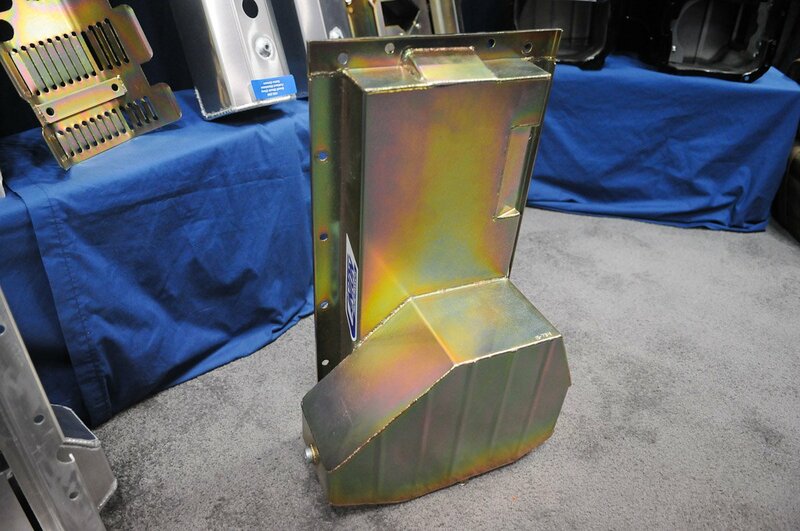 Sheet metal intakes are perfectly legal in Super Stock and for this application one of these units made the most sense. 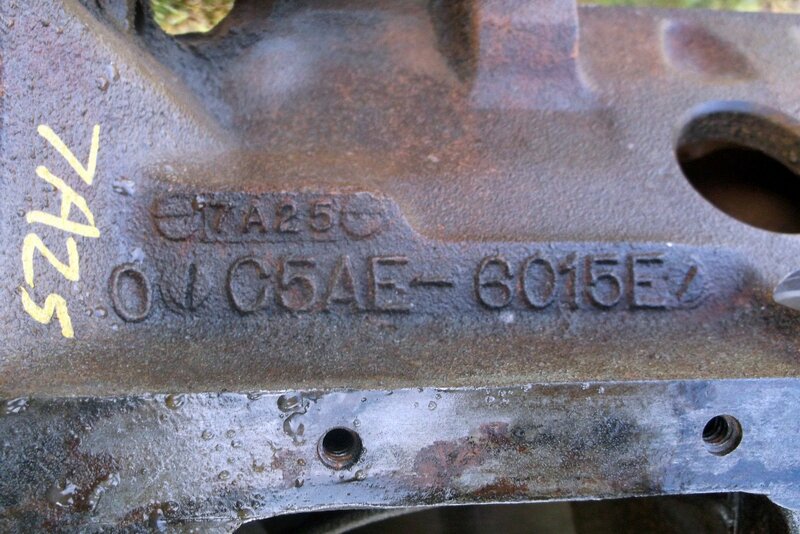 The original Edelbrock AMX cross-ram intake that was a part of the factory-built engine wasn’t being used and was replaced by the sheet metal intake. 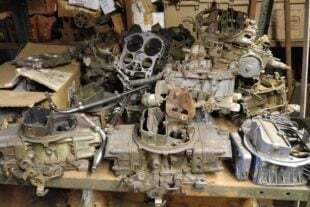 The rules do require a specific type and size of carburetors to be used, so CFE had to bring those into the mix while still working with an OEM hood. “The sheet metal intake manifold we created had to work with a dual 4-barrel top to suit a pair of Braswell-prepared 650 Holley carbs, vintage-correct and required by the rules, offset on the top plate to mimic the cross-ram’s throttle positions per NHRA rules. The restrictive OEM hood line keeps us from taking advantage of more plenum volume with the expected 9,000-plus RPM engine speeds,” Kieffer says. 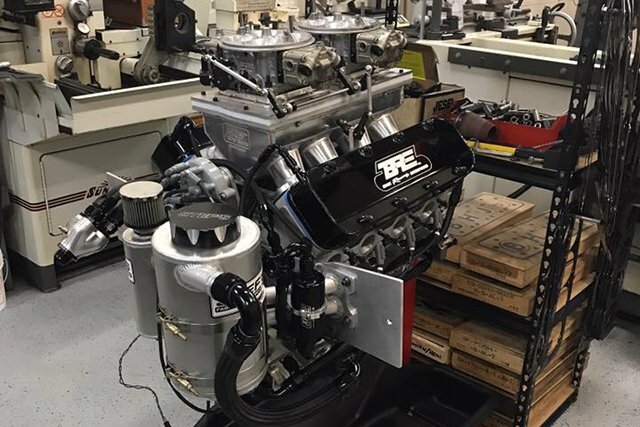 This engine build shows what kind of lengths racers go to for the extra edge required to go fast in NHRA Super Stock. 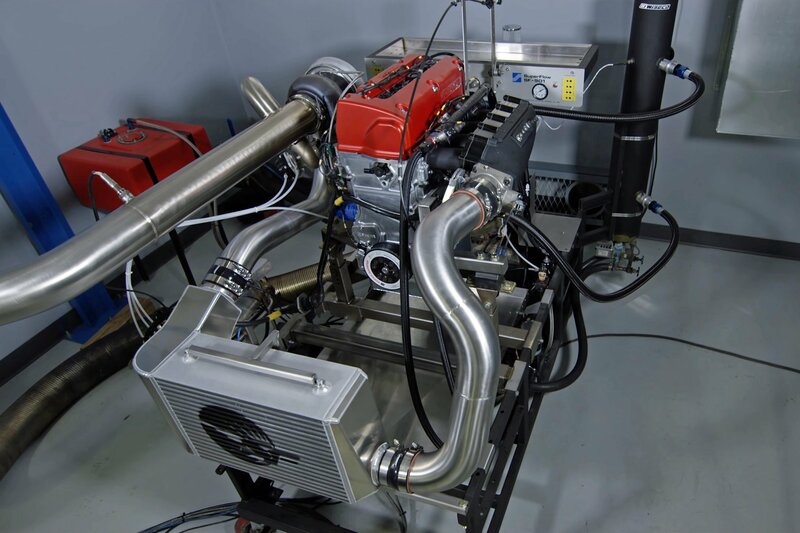 The CFE-built AMC induction system that will live under the hood of Rich Rinke’s AMX is one nasty customer that’s capable of generating impressive horsepower. Make sure you keep an eye on NHRA Super Stock in the future to see what kinds of numbers this mean small-block will run in legal NHRA trim.